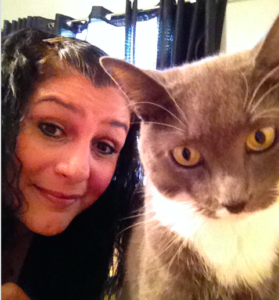 Meet Tod ay’s Rescuer: Paulette Siegel of Middle Village (Queens), NY! I volunteer at Bobbi and the Strays in Glendale, Queens, at the Atlas mall. I’ve been volunteering there for about four years. I’ve also rescued, assisted with rescue, fostered, socialized, etc. A couple years ago right after the Fourth of July, I rescued a cat that a neighbor had dumped. The cat was recently declawed and had never been outside before. After I heard about the horrific act, I went looking for the cat and found him. His paws were bleeding from his recent declawing. He must’ve been trying to get back in, or get in somewhere. He was weak, underweight, malnourished, and dehydrated. Near death, as he was out there for a couple of weeks fending for himself. I scooped him up and ran as fast as I could to my house. I had no idea what I was going to do, as I have cats of my own. I ran into the house, went to the bathroom hugged him and just cried. And then cried some more. Got myself together, fed him and started making calls. Brought him to the vet, who treated him for his open bleeding paws. Gave him fluids and antibiotics. He came back home with me and I medicated him, loved him and nursed him back to health. I connected with a rescue group and we found him a fantastic home. I stay in touch with his mom and he’s living the life he deserves! He is an orange tabby. His name is Jaxx, and what a handsome , grateful cat he is. I wish people understood the impact it has. People just don’t get it. I think that it will educate people. Others need to know what’s involved. Maybe seeing it on film will shed a different light! Go follow Paulette on Instagram (@Pizza_My_Heart). 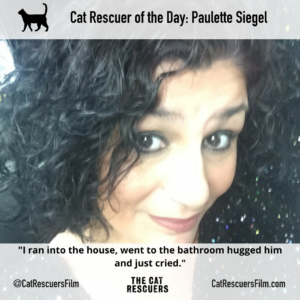 And be sure to follow @CatRescuersFilm on Facebook, Twitter and Instagram!